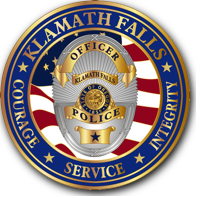 On Thursday, December 7, 2017, at approximately 9:12 a.m., Officers from the Klamath Falls Police Department responded to the First Interstate Bank at 421 South 7th Street after receiving information regarding a robbery. Members from the Oregon State Police and the Klamath County Sheriff also responded to assist. Upon arrival, officers secured the bank and initiated a robbery investigation. It was determined the suspect purported to have a weapon then fled the area after receiving an undisclosed amount of money. After information was disseminated from investigators at the scene to other officers searching the area, the suspect was located in front of the Klamath County Library at 126 South 3rd Street. The suspect was identified as Robert Sean McCarthy and was taken into custody without incident. Mr. McCarthy was transported and lodged at the Klamath County Jail on charges of Robbery II and Theft III. At this time, the incident is still under investigation. If anyone has information regarding this case please contact the Klamath Falls Police Department at 541-883-5336. Anonymous information can also be left on the Klamath Falls Police Tip Line at 541-883-5334. News release from David Henslee, Chief of Police, Klamath Falls Police Department.